Tech enthusiasts: My entire house is smart. Tech workers: The only piece of technology in my house is a printer and I keep a gun next to it so I can shoot it if it makes a noise I don’t recognize. 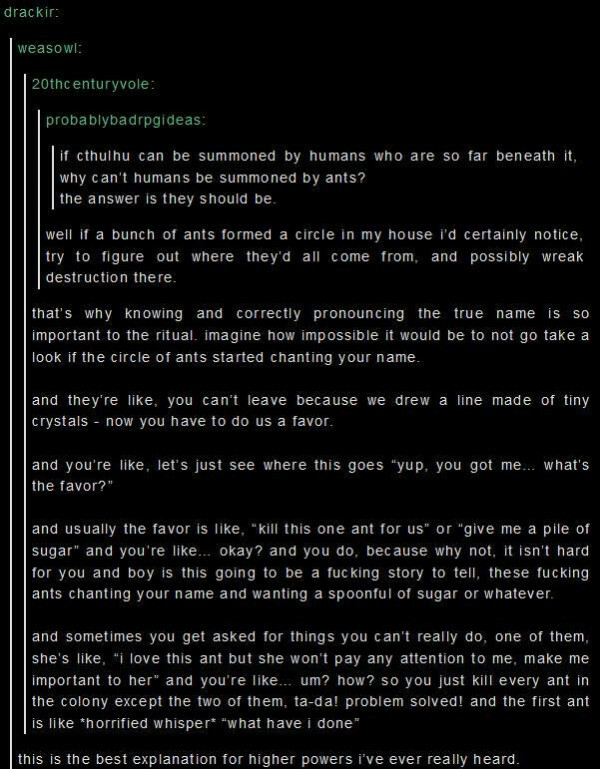 If ants summoned humans like humans summon Cthulhu. It’s wild that Twitter is quite swift at taking down tweets that offend big media copyright holders even from verified entities but death threats to @IlhanMN sit untouched for weeks. Never forget that addressing abuse isn’t a hard problem, it’s just one they don’t care about. Finally looked at why my transactional emails’ attachment icons didn’t show up on Mac. Started suspecting I was doing something wrong when I couldn’t find any complaints on Google. Turns out Mail messes up a bit if you put your message inside a <table height=100%>.